Figure 4 from the article. COP21 in Paris is fast approaching and the #BigPush is on. That means we’re forced to talk about global warming more than I’d like (which is not at all). But it’s necessary. Let’s decide if this is over-reach, hubris, rank enthusiasm, or possibly a measure of all three. 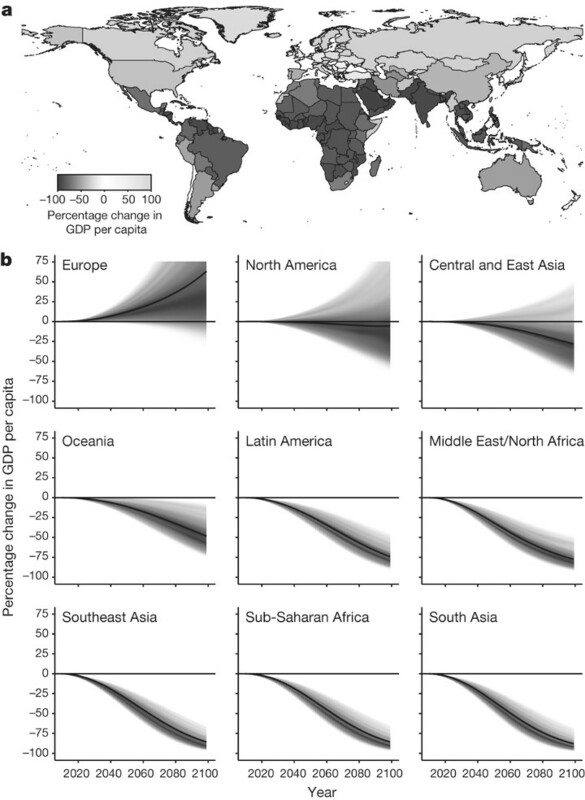 Paper is the peer-reviewed “Global non-linear effect of temperature on economic production” by Marshall Burke, Solomon M. Hsiang, and Edward Miguel in Nature. The internal alarms in readers with math will have begun. Did they say non-linear? Yes, sir, they did. To readers without math, all you need know is that non-linear models are as sensitive as feminists. The least little thing sets them rocketing away in unexpected directions. Say, have economists been able to identify the linear and non-linear non-temperature effects of the economy, such that they make successful predictions? No, sir, they have not. Then why are we bothering with this? Regular readers (whom I hope were not drinking while reading) will recognize this as scientism of the first kind, which is not to acknowledge what has always been blazingly obvious to all of mankind unless it has been certified by puzzled scientists. Good grief! My folks figured this bit of atmospheric physics out years ago when they began yearly migrations from Michigan to Florida after the first flurries fly. Climate refugees. I guess we now know why the economic activity associated with growing grapes is missing from Tierra del Fuego. Too much linearity, or something. And did you notice the key phrase? This is it: economic loss in response to climate change. This is an admission of blindness. These scientists are incapable of recognizing that good can come from “climate change,” even though everybody knows that increased carbon dioxide must be beneficial for plant life. Incidentally, as I’ve relentlessly insisted, don’t say “climate change”, say “global warming.” They promised us global warming. We can’t let them forget that. Since the climate will always change, anything that happens—and things will happen—will be an excuse for governmental meddling. This isn’t reality, it’s a model. It has some pretty math, wee p-values, knobs to twist, and other trappings standard in these kinds of things. Yet the authors commit the banal fallacy of assuming their model has identified causes of the economy. That temperature, say, effects the economy everybody already knew, and they knew it in a causal sense. There are no ski slopes in Boca Raton because of the lack of snow. Thus the economic sales of trail-grooming machines there is low. But the authors of this paper don’t mean cause in this humble (but true) sense. Instead, they think they have identified how temperature causes non-linear changes in gross domestic product, which isn’t a thing but is instead a sum of billions (trillions?) of small things. The figure above is from the paper and represents “Change in GDP per capita (RCP8.5, SSP5) relative to projection using constant 1980–2010 average temperatures.” Except for Europe, North America, and Central and East Asia, the economies of the world essentially end by 2100. This is what 75%-90% reductions in GDP mean. Europe, enlightened as always, is the only region which prospers. Conclusion? If societies continue to function as they have in the recent past, climate change is expected to reshape the global economy by substantially reducing global economic output and possibly amplifying existing global economic inequalities, relative to a world without climate change. In their favor, these authors made testable, public predictions. We’ll be able to check their model for accuracy. This is how science is supposed work. But I think anybody who claims to believe this model is lying. Strong words, right? Okay, believers, prove me wrong. Invest right now, using your money, in the model’s conclusions. Bet big. And (not that I don’t trust you) show me your receipts. If the model is good, you’ll clean up. There’s no “scientism” in the original statement at all…just “weasel words “carefully chosen to suggest something that might be but for which there ain’t yet enough evidence to be sure. WHAT IT REALLY SAYS: “If societies continue to function as they have in the recent past, THEN CLIMATE CHANGE WILL HAVE NO EFFECT ON THE ECONOMIES BECAUSE IF CLIMATE CHANGE DID HAVE A SUBSTANTIAL EFFECT ON ECONOMIES THEN SOCIETIES WOULD NOT CONTINUE TO FUNCTION AS THEY HAVE IN THE RECENT PAST. THEY’RE EITHER GOING TO FUNCTION AS THEY HAVE, OR THEY ARE NOT…CAN’T BE BOTH AT THE SAME TIME. “…climate change IS EXPECTED TO [meaning: We the authors expect it to…even though as we noted earlier we’ve no evidence supporting this expectation at all…not a whit of it…] reshape the global economy by substantially reducing global economic output AND POSSIBLY AMPLIFYING [translation: and possibly having no effect whatsoever on] existing global economic inequalities, ..
That last para is a case-study in contradictory circular reasoning supported by emotional reasoning, but essentially vapid of substance. That’s encountered in cults that apply “mind control” (see Steve Hassan’s book, Combating Cult Mind Control). So, this reminds me of a conference I just attended on operations research. Sitting there, listening to the various presentations, too often the authors were taking data, fitting curves of 6, 8, 10 parameters; determining “wee-pee” values and producing elegant mathematical renderings. Yet, when interrogated as to the BEHAVIOR of the data — causal, theories, otherwise — the authors predominantly responded that their model fit the data quite well. But, when asked WHY their models fit the data: what’s the underlying physics, and have they tested prospectively, again, the predominant answers were no–that has yet to be done. Conclusion: what are we teaching our undergraduates? What are we teaching our graduates? What are our professors teaching??? Is there something so satisfying about playing with equations and software tools that people just get caught up in the fun of the data processing, without considering causal nature of reality? When I was a graduate student I had a course in non linear systems. You can’t solve the equations. What students are learning: That they can attribute causality. Causality gets funding. Peer reviewed in Nature? You must have meant JIR* and your enemies made a substitution. Just so we non-scientists don’t get misled, I assume you meant that non-linear systems can’t be solved analytically although they can be solved numerically. (Although even that isn’t completely true; people who know this stuff tell me that, e.g., the non-linear time-variant system dx/dt + cos(t) exp(x) = 0 is soluble analytically .) Numerically, even retired lawyers can routinely solve a wide range of non-linear systems . John Z.: Not sure two Tylenol is enough for the headache this causes. In response to your question “Is there something so satisfying about playing with equations and software tools that people just get caught up in the fun of the data processing, without considering causal nature of reality?” consider how many people run around with cell phones mindlessly playing games like Candy Crush all day rather than interacting with other people. Consider how many teens live entirely on social media, to the extreme of texting each other when in the same room. I think the answer is a resounding “Yes”. Gary: What a great link! All: As has been pointed out, climate change, whether “natural” or manmade, has always occurred, and humans have adapted. Somewhere in the last 100 years, the planet became incredibly fragile, life on the planet became incredibly fragile and everything lacks the ability to adapt to these changes. Darwin was wrong–evolution apparently happens very suddenly and threatens to wipe us all out any minute now, since we became unable to cope. I don’t know, maybe that’s what happened to the dinosaurs. Suddenly they became fragile and all died. I guess that could have been what happened and Darwin just missed it. This is the second time today I have read that people from warm places are less productive than people from cold places. Greece is less productive than Germany. Southern Italy is less productive than Northern Italy. Mexico is less productive than the US. The notable exception is South Korea, which beats NK! Somehow, it seems that there must be more to it than just temperature. ONLY the RCP8.5 emission scenario doesn’t allow a global recession of 100% by 2100 in Asia, as that would reduce the catastrophic emissions to a harmless level. RCP8.5 does not have an economic negative feedback built in. So you can’t have your cake (emissions caused by economic growth) and eat it (have a global recession). So providing the third world with affordable energy via fossil fuels would reduce them to even more abject poverty. That might seem counter intuitive but it’s a non linear model see? Yes, you can evaluate the equations numerically but that doesn’t really solve them. We joked that was cheating. Sheri: Funny you should mention dinosaurs. Last night as I was cleaning up after putting my kids to bed I was pondering the latest stupidities, such as the NY Attorney General investigating Exxon because they had the audacity to examine the issue of Global Warming, AGW in fact, during an epoch when the National Academy of Sciences took global cooling more seriously, and I wondered how we have gotten to such a state where mere research and thought is actionable. I wondered if we are seeing something of what evolution produces. Successor species resemble the juveniles of ancestral species. It is called juvenilization, a learned word that my spell-check does not recognize. I wondered last night if successive generations within a particular culture or civilization come to retain more and more the characteristics of juveniles until the culture is no longer viable. There are advantages to retaining juvenile traits longer, such as retained curiosity, and more learning and inventiveness; but it must present real disadvantages beyond some point. I now run into many very immature adults in their 40s and older. I judge this by their behavior and attitudes, especially at work. Maybe at age 63 I have become a deficient measuring device, but I seem to see immaturity as increasingly common, and a growing burden. RCP8.5 is already a model, so this is a model based on a model. Russian dolls anyone? Also, as Hans Erren points out above, RCP8.5 requires everyone on Earth in 2100 (15bn I think in the model) to be, on average, as rich as we in the West are now. So, if model 2 (this ‘paper’) is correct, model 1 (RCP8.5) can’t be. So model 2 can’t be either. QED. Finally, RCP8.5 posits that, by 2100, we will have dug up and burnt every single piece of coal that exists on Earth. And then dug it all up and burned it all again. 5 times over in all. I am no statistician (unlike many on here) but to me, that seems, er, impossible.